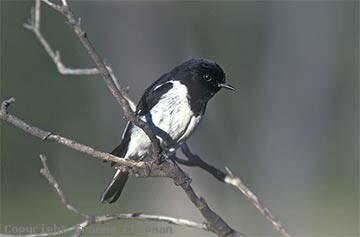 Hooded Robins occur nearly all over Australia in suitable habitat, with the exception of Cape York and Tasmania. 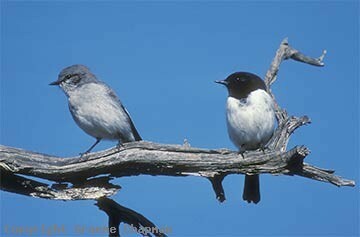 In Tasmania they are replaced by their close relative, the Dusky Robin. Hooded Robins are more common inland in more open woodland and shrubland away from the coastal forests and ranges. They are particularly fond of areas where there is fallen timber and dead trees where their permanent territories can exceed 10 hectares in size. They feed mainly on the ground and sit quietly on a vantage perch for long periods scanning the ground. 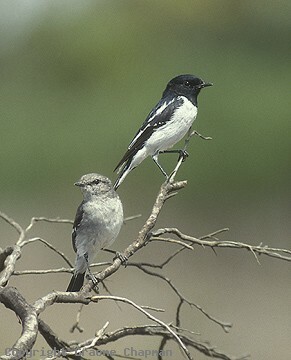 When breeding they occur mainly in pairs but occasionally an immature helper has been seen attending a nest. Immature males are quite distinctive - instead of the black bib it is grey and so are the upperparts. Hooded Robins become active very early in the morning and their territorial advertisement calls, given before daybreak, are a feature of some inland regions. Sometimes they even call during the night. 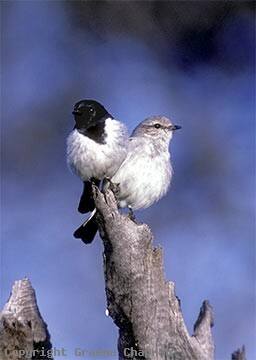 385201 ... Hooded Robin, adult pair.